I literally cut my artistic teeth at the Armadillo; it was the scene of my first Austin music art crime. It started me on my career as a music art perp and I have been committing such felonies and misdemeanors ever since. ?Since? being the John Sebastian poster of October 29 ? 30, 1971. 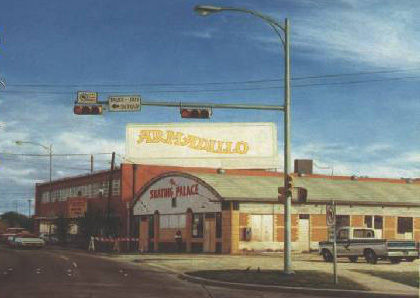 It was my great fortune to be professionally and amorously associated with the Armadillo World Headquarters, the premiere Austin music venue for the entire decade of its life. New Year?s Day, 1981 dawned on a much diminished capitol city after its passing, and there has never been anything like it since. The cultural power and influence of AWHQ emanated far beyond its ancient Armory walls, beyond the city limits, beyond the state line, even beyond the nation?s borders and the seas of the world. It was to have an international musical reach, and would become a vital part -- if only in small ways commiserate with large distances ? to the global realm of human cultural endeavor. In its time, in this city it was a counter-cultural colossus; the driving wheel of a golden age in Austin music. It was a progressive beacon to a benighted cultural, societal, and political Texas. It was a vital and determinate force in national music throughout the 1970s and beyond. The impact of the Armadillo?s absence today has more positive force on the character of this state, its capitol and its people than all of the present partisan national political forces arrayed against them. The following is a portion of the body of work that I did for this force of musical nature; and of which I am very proud.